Apparently, we've just officially moved into Autumn. It certainly shows in how the weather has been recently! For once, I'm actually sort of looking forward to Autumn and Winter as I have grand plans for outfits for the colder weather, as well as plenty of ideas for things to do in the coming months. Needless to say, I had loads of fun posing around and pretending I was an extra from Poirot or somesuch. The crochet style is looovely - I've been coveting crochet thing recently since I think it's a super stylish look and an easy way of incorporating something quite vintage into my every day look. The back of the top is pretty too! It goes great with my black palazzo pants and gives a lovely elegant 20s/30s feeling. 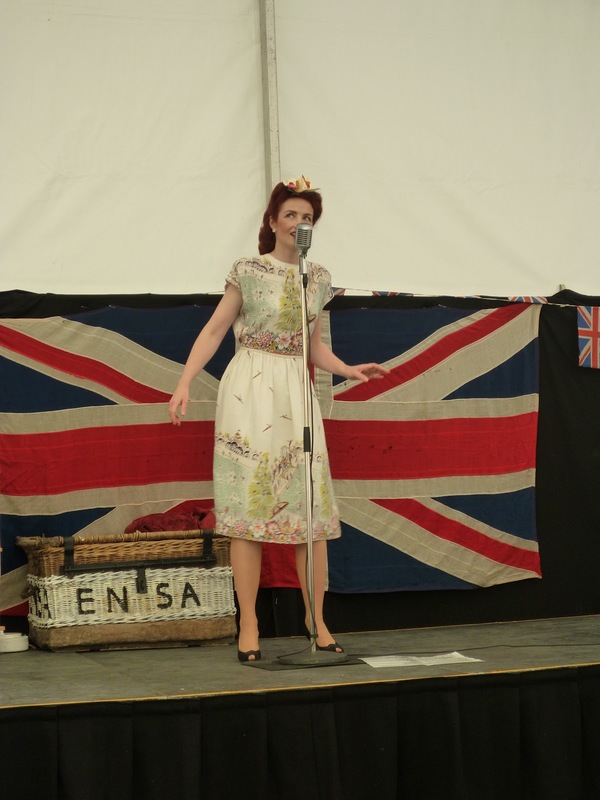 Next up: I have my outfit sorted for the 1940s event at Rufford Abbey at the weekend. Hopefully I will be able to get a similar amount of photos as I did for Crich, including a quick tryout of the outfit before I go. Excited! 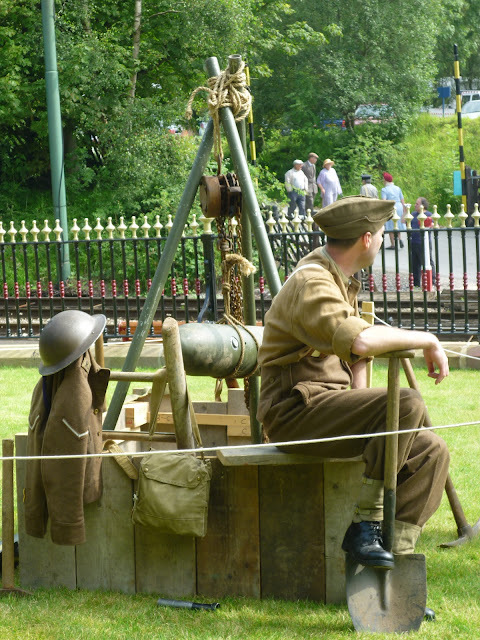 I finally got hold of the photos my mum took of me while we were at Crich. Unfortunately, some of them were... less than flattering... so I've picked three of the best. I also had my photo taken by several photographers, two of which gave me their card so that I can see the photos. They aren't available yet, but I will keep checking back on the photographers' websites until they are. Above: Dibs on being the next companion. I don't actually dance although I would love to learn. Quite a few of the people there did know how though, so I got a bit of a go anyway. I took so many photos at Crich that it's been really hard to choose my favourites to show. Looks pretty authentic, I think! The lovely Miss Lola Lamour. I didn't manage to pick myself up a dishy G.I. but the American army camp was interesting to look round anyway, and even had a tent where they were showing old films. I'm glad there wasn't an actual air raid, as I never did manage to find the shelter. There was even a visit from Mr Churchill. I do actually have some photos of myself from the event, but none that ended up on my own camera so I will have some of those up once I've managed to get hold of them. 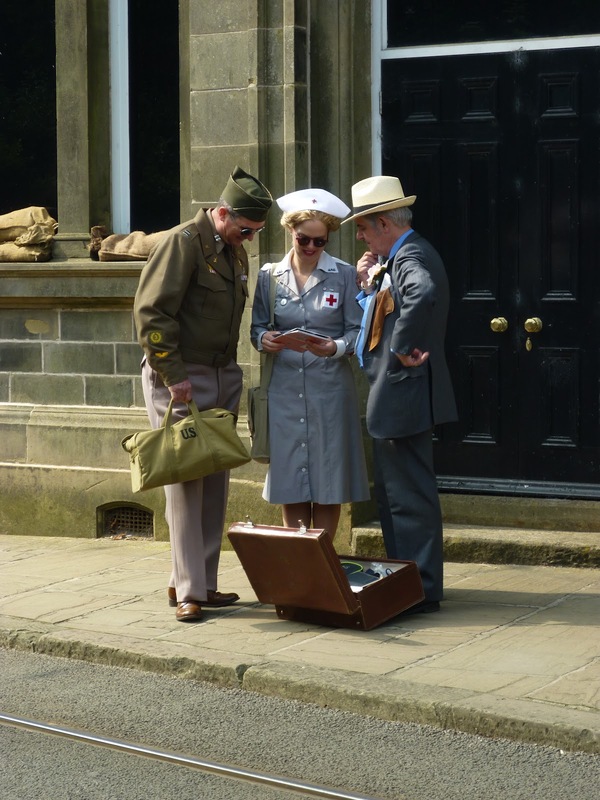 The 1940s weekend at Crich was amazing! I went for the Saturday with my mum and had a whale of a time. It's the first event of this sort that I've been to, but it definitely won't be the last! My uniform looked really good, although it was less than authentic compared to a lot that I saw. I still think it gave the idea though, which is the main thing. We were issued with identity cards and ration books on entry, which we then had to keep with us in case we were asked to prove we weren't enemy spies. They'd got things set up in different parts of the site and you could go and speak to the re-enactors about the history behind it. Part of the British Army camp. Watch out for the UXB! The pub was serving wartime meals but we'd packed up spam sandwiches and ginger beer. Everyone at the pub seemed to be having a great time though, and were entertained by a gentleman with an accordion. The weather stayed nice for the whole day as well, which was a bonus! I made a second attempt at the victory rolls/snood combination today. I'm pretty much happy with it now, I just need to give it another go tomorrow to see if I can get it any neater. I tend to struggle quite a bit with hair related things both because my hair is extremely fine and very badly behaved, and because I have next to no talent for it. Hey ho, practice makes perfect, right? I'm going to visit my grandparents tomorrow and I can't wait to show them my uniform so I'll be able to give the hair a trial run alongside the uniform. They don't look too bad all in all! I'm oh so tempted to accessorise the hair net with a big flower of some kind, but just not with the uniform. I actually think this is something I could work into my everyday outfits now that I feel I've got the hang of the hair net a bit more. My "gas mask" for the 1940s event at Crich is finished. I wrapped a box in brown paper (apparently this is something people quite often did, as well as making other kinds of covers for the boxes), copied a label I found on Google and stuck it on the top, then attached the string to the sides. The box is slightly on the large side and the string is attached with about four staples and sellotape each side, but it will do me for now. Hopefully the weather will stay good on the day and not rain all over my cardboard creation.